Happy Friday, friends!! (Am I the only one who is utterly thrilled that it’s the weekend? This has been the longest week….) Anyway, I have a finished project for you today that I peeked on Instagram a few days ago. One of the things I vowed to be better about in the New Year was to create things I liked just because I liked them, not to put pressure on myself to create things because I think others would like them. 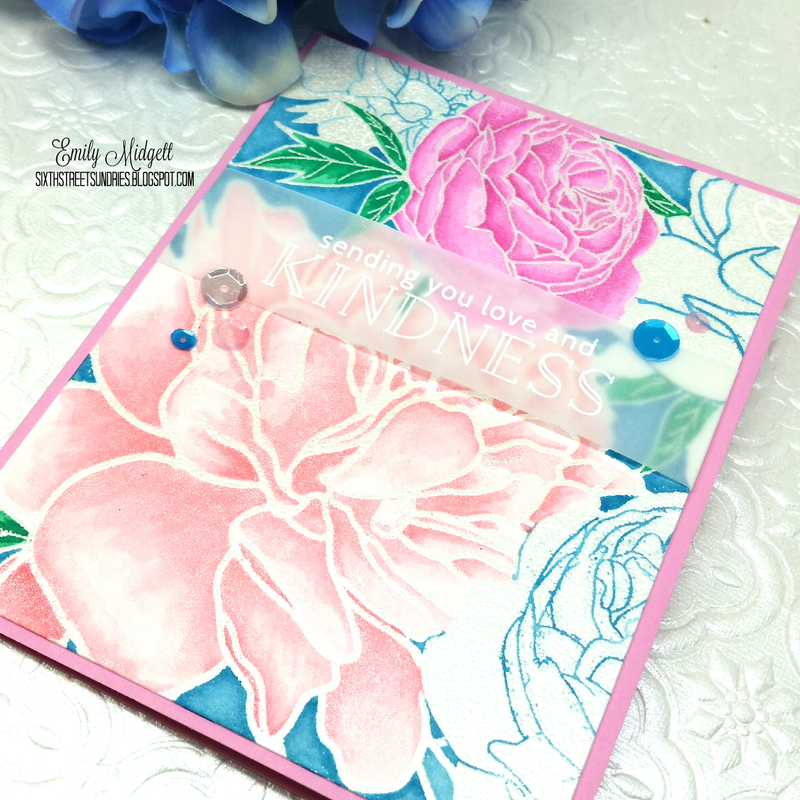 I hadn’t pulled out my Peony Garden background stamp from The Ton in awhile, so I thought I would pull it out and do some soft watercoloring for a card for the Lasting Hearts Card Drive. I started by heat embossing the background on hot press watercolor card stock using Hero Arts’ White Satin embossing powder. Then came the uber fun part: the watercolor. I debated on whether to use my Zigs, but I wanted a more subtle wash of color, and I confess that I haven’t yet mastered the beautifully subtle coloring that some others are able to achieve with the Zig markers. I decided instead to use Distress ink that had been diluted down. A bonus to using Distress ink is that I can easily add Perfect Pearls to the wash. I started by tapping Spun Sugar Distress Ink onto a clear acrylic block, then adding quite a bit of water to dilute the color, to which I added a few paintbrushes dipped in Perfect Pearl powder. I then used this color wash to add color to the entirety of the large flower, not taking much care to add shading, but making certain that every petal was colored a delicate pale pink. I then tapped some more Spun Sugar onto my block and added a few taps of Worn Lipstick, then added more Perfect Pearls and water to dilute. Because by this point the Spun Sugar wash had mostly dried on the large peony, I was able to add the darker shade of pink over the top without it mixing and sinking into the paper too badly, and get some really good depth on the petals. I did the same process with the smaller peony using only Picked Raspberry Distress Ink. I laid down the very pale color wash first, then went back later with a less-diluted and thus darker shade of the same color to add the shadows. It’s difficult to tell in the photos, but the flowers have wonderful shimmer in real life. The leaves were colored with diluted Lucky Clover ink (LOVE that shade of green with these pretty pinks! ), and the background was painted with diluted Broken China ink. 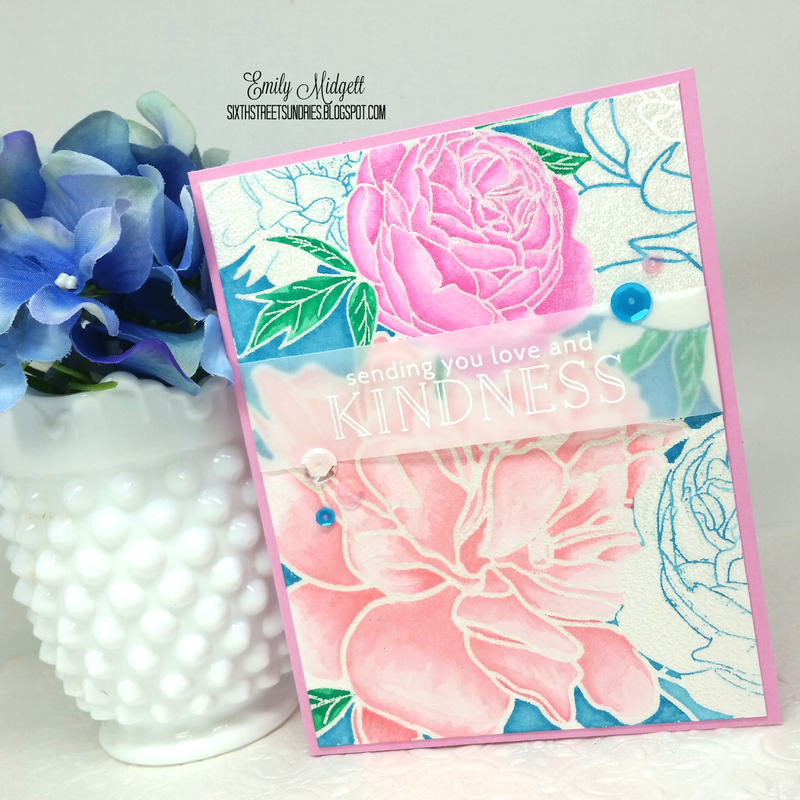 To add the sentiment, I simply heat embossed one of the lovely sentiments from the Acts of Kindness stamp set by Hero Arts onto a strip of vellum. I had spent so much time on the background that I didn’t want to cover it up, so I opted for this subtle addition. I added a few sequins in complementary colors, making certain to overlap the sequins on the edge of the vellum, to kind of help keep the vellum from curling up. I hope you enjoyed this project! I’ve got several more projects that I’ve completed for the Lasting Hearts Card Drive that I’ll be blogging about over the next week or two. I’m so pleased to have such a good outlet for me to channel my creative energies, and I hope that you’re inspired to create some projects for this worthy cause, as well. Have a fantastic Friday and a wonderful weekend, my crafty friends! Wow!! This card is so beautiful!!! Thanks for sharing!